It is an axiom of sound environmental policy that higher housing densities are better than low density sprawling subdivisions. The reasoning is obvious to anyone stuck in endless traffic heading for the exurbs: shorter commutes, which improve family life and air quality, conservation of cropland, which would otherwise be paved over with thousands more faux stucco mansions, and a healthier lifestyle centered around a dense community accessible to pedestrians and bicyclists. Granted--but not all density is equal. This topic arose in long weekend conversations with my brother-in-law, who is a professor of art at a major university (my alma mater, as it happens). He pointed out that lofty apartment living is very high density, but residents have no place to garden or work with tools--two activities which are not only important to both of us as individuals, but are defining characteristics of the human species. In theory, communal gardens and work spaces are possible; while living in a tiny studio in the super-dense Makiki area of Honolulu in the mid-70s, we signed up for a small garden plot in the then-new City communal gardens. Each participant received a plot about 10 feet by 16 feet for their private use. An amazing quantity of vegetables can be grown on even this modest plot of earth. Similar community workspaces are available in various locales--for instance, The Tinker's Workshop in Berkeley--but over time, it seems that most people prefer their own private workbench or garage. Density as measured by number of residents per square mile can describe wildly different urban environments. It is instructive to compare global cities by their density; this chart lists the population densities of a few well-known cities around the world. Scroll down this page and glance at the photo of a typical Parisian street, and you'll see why Paris is twice as dense as New York City. You may be surprised that a city (not the suburbs, but Paris proper) which is "only" six or seven stories in height is so much denser than high-rise-rich NYC. Certainly, Parisian apartments are modest in size, and that is a key metric in density. But is turns out uniformly low-rise buildings are denser than high-rises surrounded by parking lots, open spaces or commercial (non-dwelling) areas. As the accompanying photos of Parisian parks reveals, the high density of Paris is offset with vast tracks of parkland and urban gardens--for instance, Jardins du Luxumbourg. But the trade-off mentioned at the beginning of this entry is definitely in force: there is no space in most Parisian apartments to work on a bicycle or build a cabinet, and no space for a garden, unless you count a flower box as tillable soil. 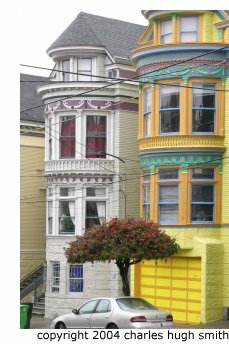 The San Francisco Victorian pictured above, on the other hand, has a small one-car garage (not always, but often) and a small backyard--perhaps too shaded by surrounding houses to flourish as a garden, but a patch of soil nonetheless. While great parks (San Francisco has its Golden Gate Park) ease the stresses inherent in beehive densities, they are public, not private spaces, and you can't grow your own flowers and vegetables in them. Is this an argument for exurbian homes of 4,000 square feet and three-car garages? Obviously not. Such exurbian subdivisions may have more vehicles than people (perhaps ten residents per acre or less), and while the residents have the space to work on a bicycle, they have neither the time to perform the work (most of their non-working life is spent commuting) and no place to ride the bike even if it is in working order--all the roadways are designed for cars and trucks, not bikes. But environmentally sound urban planning does need to recognize that private work spaces and gardens are integral to human life. Such private worlds, however small, should not be sacrificed to the gods of density without compensating mechanisms--or at a minimum, recognition of what is being lost in a high-rise lifestyle devoid of dirt, grease and sawdust.